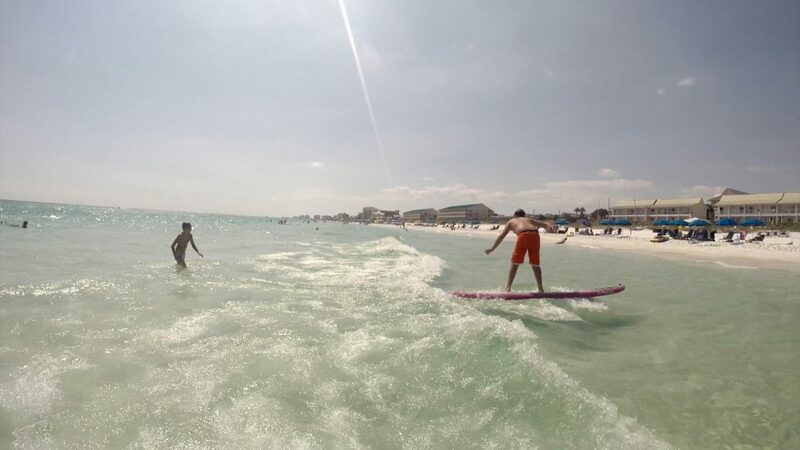 In this article, learn valuable tips about paddle boarding in Destin Florida. 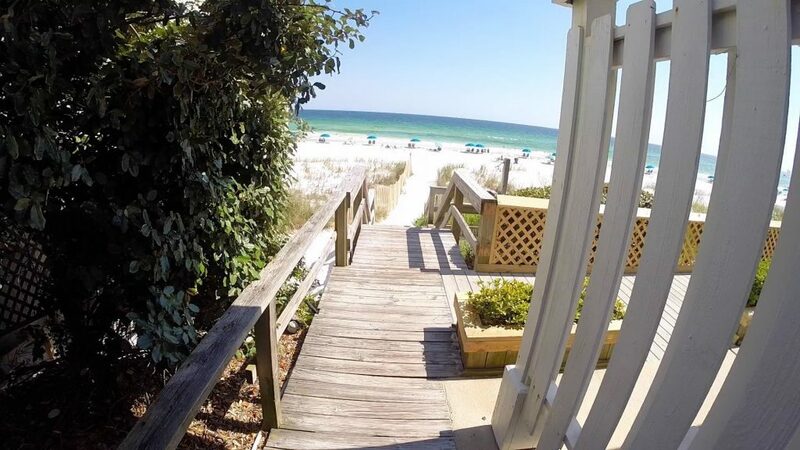 Ask for Rich to rent paddle boards and a full beach service. My family and I love spending time on the beach. Therefore, we all fell in love with sport of paddle boarding. 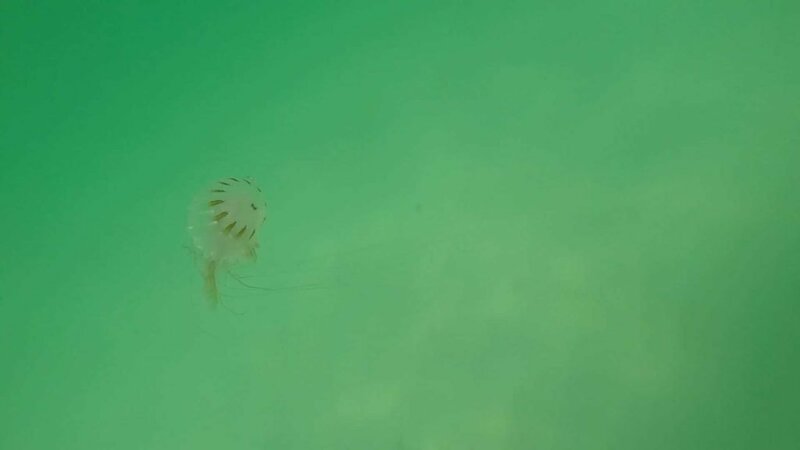 Additionally, we recorded our paddle boarding encounters sharks, dolphins, sea turtles, and gigantic jellyfish. 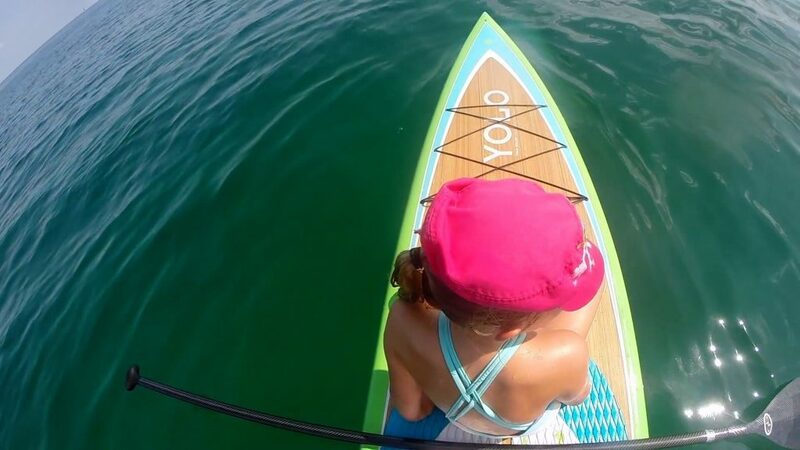 Keep reading this article to learn how to get into the sport of paddle boarding (SUP – Stand Up Paddle boarding), increase chance to encounter wildlife, best paddle board gear, and much more. Before investing time and money into paddle boarding, I recommend renting a paddle board for a day or multiple days to make certain you like the sport. Lets face it, paddle boarding simply looks cool. A person standing up on a paddleboard in the ocean or lake appeals to most people. Obviously, some people invest a lot of money in a paddle board before they step foot on one. In short, don’t be one of these people. Ultimately, hobbies are expensive and paddle boarding is no exception. Like most water sports, paddle boarding is a fun sport and a great full body workout. Also, your entire body is involved in each proper paddle stroke – legs, core, arms, shoulders, back, etc.. Essentially, paddle boarding is harder than it looks. Most paddle board retailers allow potential customers to try paddle boarding for free. In addition, they have demo days where they bring out a variety of boards for people to try out on the water. Ultimately, paddle board retailers and manufacturers want you to enjoy the sport and become a lifelong customer. Obviously, they don’t want to sell you a board you will never use. I encourage you to buy a used board before buying new. As your paddle board skill increases, you will gravitate to a certain style of paddling which may call for a specific type of board. The essential gear for paddle boarding are a paddle board, paddle, safety gear (life jacket & ankle strap), and a way to transport your board. Before deciding on a board, you must consider what activities you plan to do while paddle boarding. Will you be traveling with your board on a plane? You must also consider your strength and body weight. For example, it is difficult for a person 250 pounds or above to stay balanced on a race board. Additionally, a board that is at least 34″ wide and 12′ long will be a good choice for people who weigh 250 pounds or more. 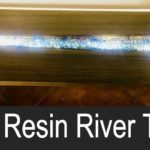 Essentially, there are 2 paddle board manufacturers in Destin and these manufacturers have resellers throughout the country. Bote has a store in Destin and they manufacture their boards locally. 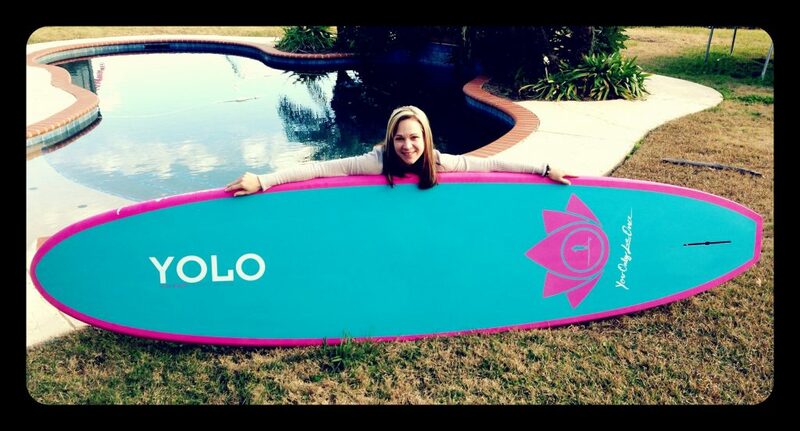 Yolo Board have a store in Miramar Beach and Santa Rosa Beach (30A). Both companies produce great boards and each have their own style. Often times, some people say Bote is a ‘Destin/Fishing Company’ and Yolo is a ’30A Surf/Bike Company’. On the other hand, people who like 30A go with Yolo and people who like to stick around Destin go with Bote. Essentially, this is just perception and isn’t true in my opinion, but it is true for others. Ultimately, I have a strong preference between the two companies due to my paddle board purchasing history. My first paddleboard was a 12′ Yolo fishing board. 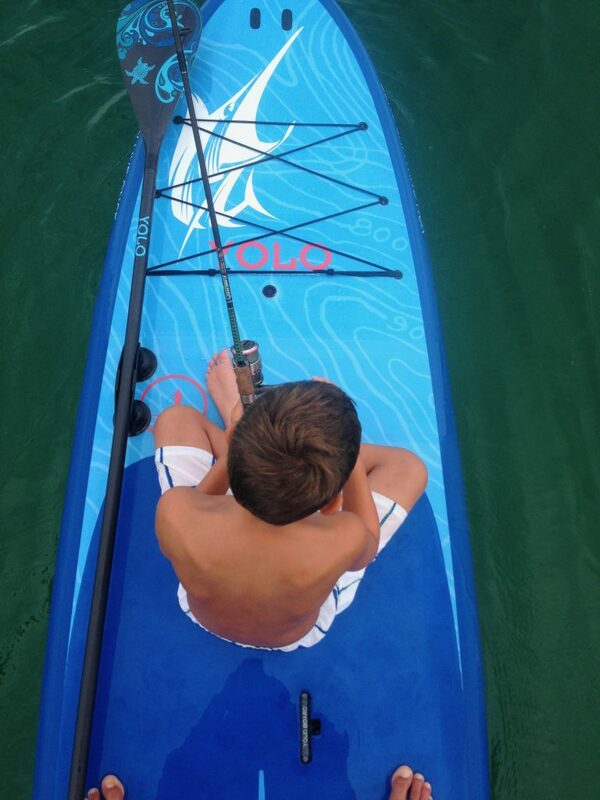 Furthermore, I chose Yolo simply because when I thought of paddle boarding, I thought of Yolo. Ultimately, I chose the fishing board because I am 6’7″ and 225 pounds, so I needed something stable. After owning this board for less than a year, I wanted a faster board. Before I bought another board for myself, I bought my wife an 11′ Yolo recreation board for her birthday. Also, she still has this board and it fits her needs perfectly. Next, I sold my Yolo fishing board and bought a 14′ racing board. This board was considered a racing board because of the displacement hull (V-hull) in the front and it’s 14′ length and 31″ wide. 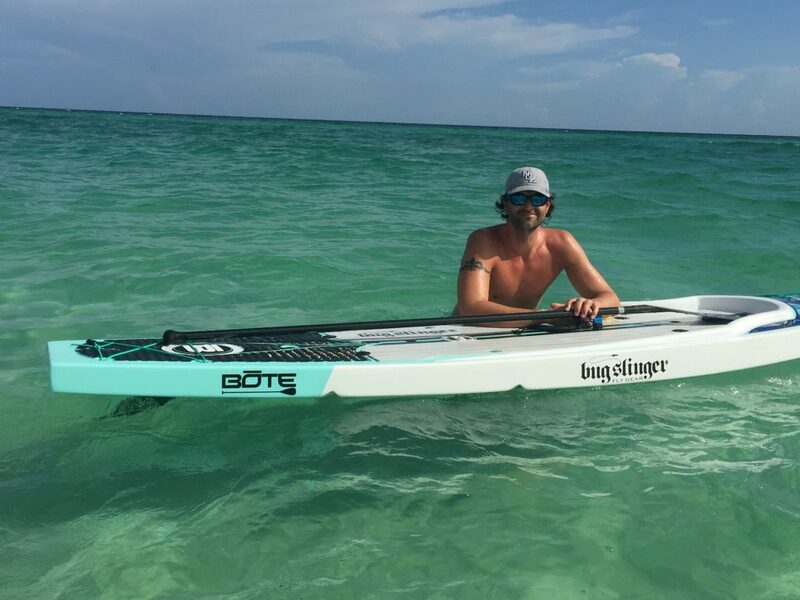 Finally, I found the perfect paddle board for me – the Bote Rackham Bugslinger. The Bote Rackham handles rough seas, stable enough to fish from, and fast enough to get places quickly. 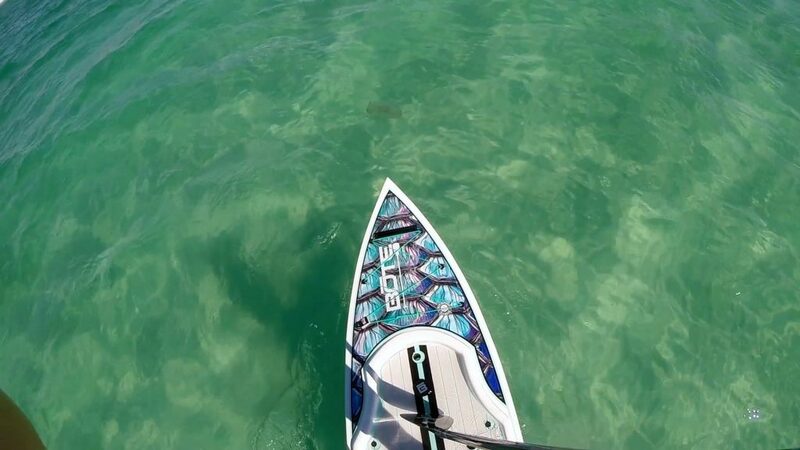 Bote Board continues to revolutionize the paddle board industry with their innovative products. Obviously, Bote boards are beautiful. More importantly, Bote boards are precisely engineered to serve a purpose depending on which model chosen. Ultimately, I chose the Bote Rackham because of its versatility. Paddles are like baseball gloves – they don’t change that often. 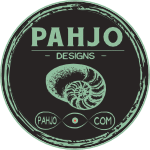 You can buy a paddle from Bote or Yolo and they are very good paddles. My preference is to buy a paddle from a company that specializes in paddles. I like quick blade paddles because you can customize them online once you know what type of paddle you want. Additionally, I am 6’7″ tall and need a paddle that is taller than the ones that are sold by Yolo and Bote. The paddles sold by Yolo and Bote are not long enough for me even if they put a handle on the paddle without trimming it down. I recommend purchasing an adjustable carbon fiber paddle as your first paddle. 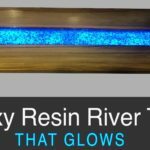 This paddle will be light enough for you to use on the water without arm fatigue due to the weight of the paddle. Furthermore, the paddle can also be adjusted to a height that is comfortable for you. First, the measurement is determined by measuring the distance from the floor to your wrist below your palm while your arm is comfortably raised up. Using this measurement, paddles are cut to length and a handle is glued in place. The length cannot be changed after the handle is glued on according to your measurement. 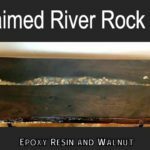 Once you find your sweet spot in length by using your adjustable paddle for a while, your next paddle can be a fixed paddle. Or, just stay with the adjustable paddle. It is vitally important to safely transport your board on your vehicle. I encourage you to not go cheap when it comes to board transport. A paddle board is expensive and you don’t want to see your investment sliding on the concrete. 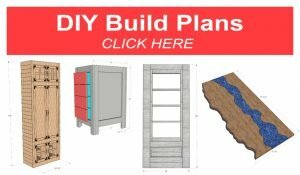 There are a ton of options for transporting your board on your vehicle. 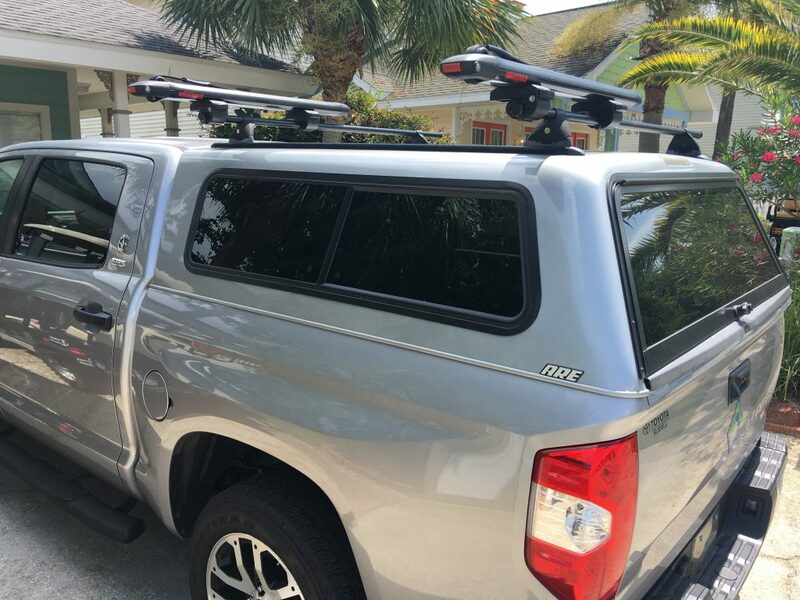 I have a truck (Toyota Tundra) with a truck cap over my truck bed, so I’ll explain my setup below. I have the Yakima SUPDawg to hold my boards. 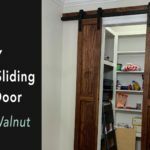 These can be mounted on round bars or oval-shaped bars. These carriers are awesome because they secure your board and the locks prevent theft. The base of my setup consists of the Yakima Skyline Towers, Yakima Crossbars, Yakima Tracks, and Yakima Landing Pad. Most SUVs and trucks come from the factory with tracks. More than likely, you will only need to purchase the Yakima towers, Yakima Crossbar & Yakima SUPDAWG. 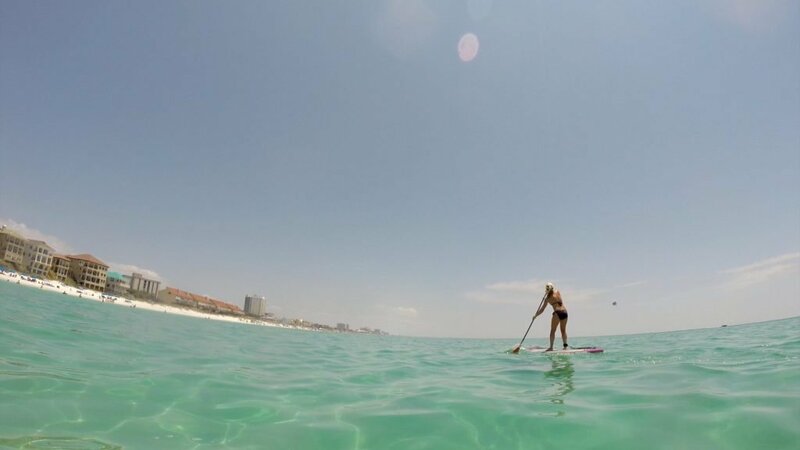 Paddle boarding in Destin Florida is simply beautiful. The water color & clarity is second to none and there is plenty of wildlife to see if you know when and where to paddle. 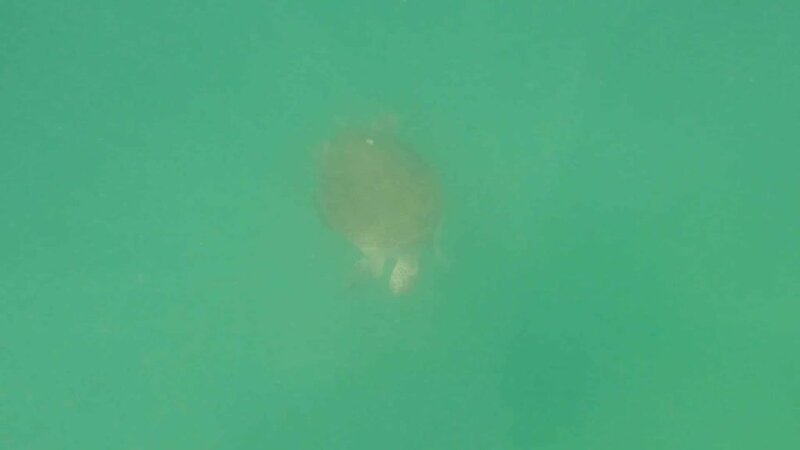 I like paddle boarding on the beach because of the water clarity, clear water, sand, and it is the best place to encounter wildlife. Paddling on the beach can be difficult due to winds and rough seas if you go during the wrong time. 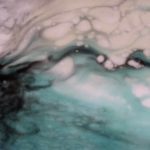 During the spring and summer months, the ocean is relatively calm during the early morning hours and rough in the afternoon/evening hours. 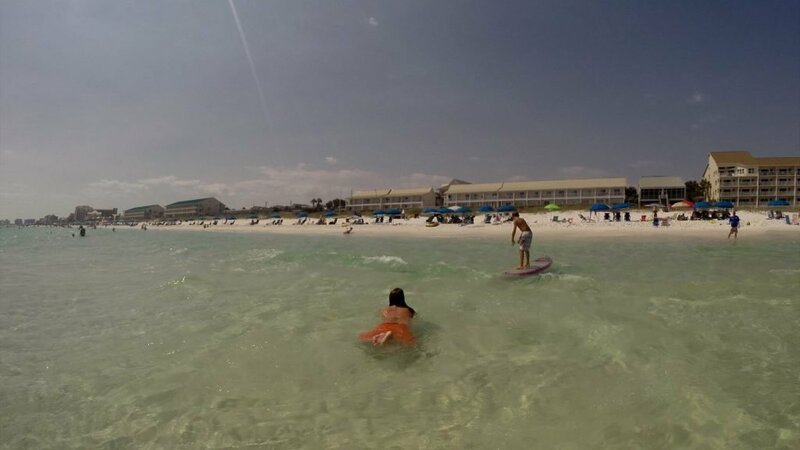 I recommend to paddle board in Destin Florida on the beach in the early morning hours (dawn until 9am). This is also the best time to encounter wildlife because they normally feed in the early morning hours. Paddle boarding in the evening hours is difficult because the ocean is normally choppy due to the south wind during this time of year. 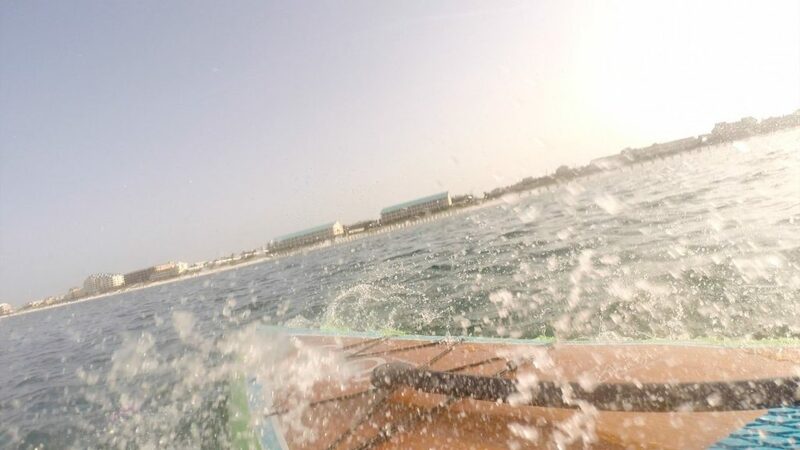 I enjoy being on the water in the morning and leaving my paddle board on the beach during the day. The kids like to surf on my wife’s paddle board and use mine as a platform to jump into the ocean. During the fall and winter months, you can paddle board on the beach at anytime during the day because the wind is normally out of the north. The north wind flattens the ocean like a lake which makes it fun to paddle board. Be aware, it gets cold in the open ocean during this time of year so dress accordingly. Also, a strong north wind can carry weak paddlers out into the ocean further than you want to go. 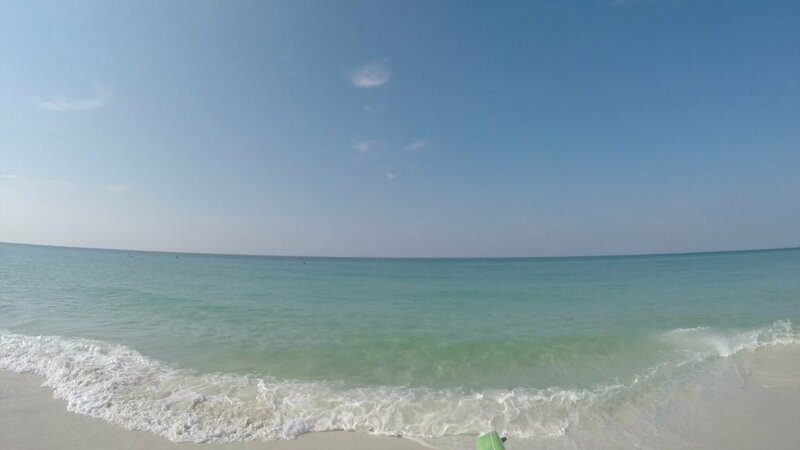 There are more sharks than people realize at the beach in Destin, Florida. 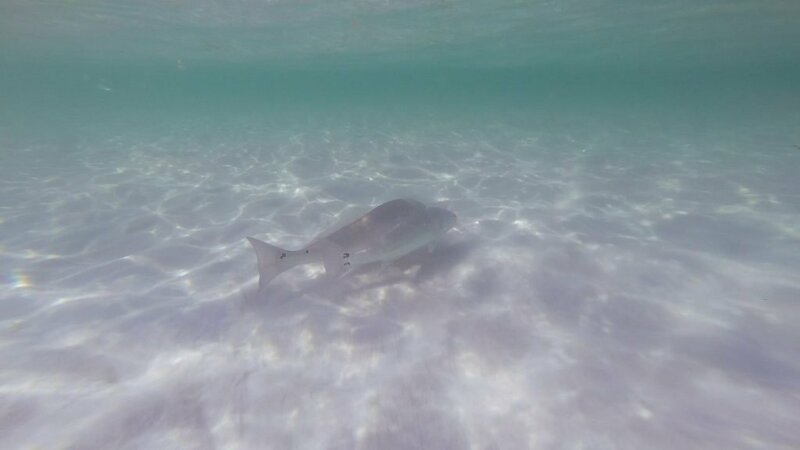 They normally hang out at the second sand bar and beyond, but I see them in shallow waters as well. While this may scare the Jaws movie fans, it is actually refreshing for many reasons. Sharks are a vital part of the Ocean’s ecosystem. Secondly, there would be a shark attack every hour of every day if humans were on the shark’s menu. 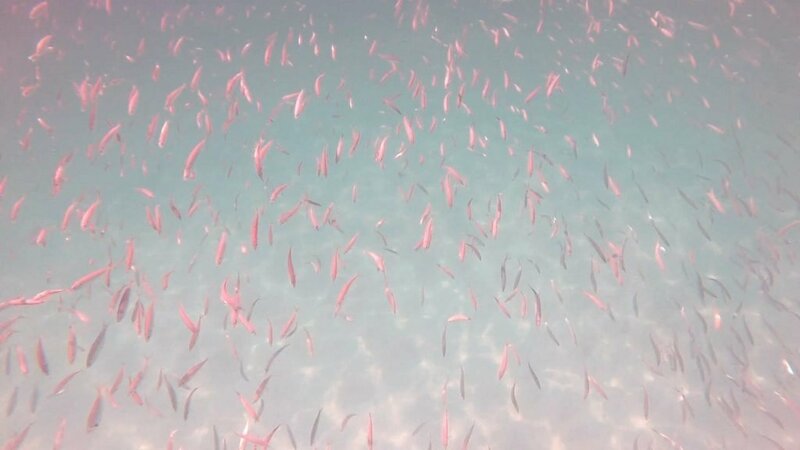 I caught a school of sharks on camera while on the water with a friend early in the morning. 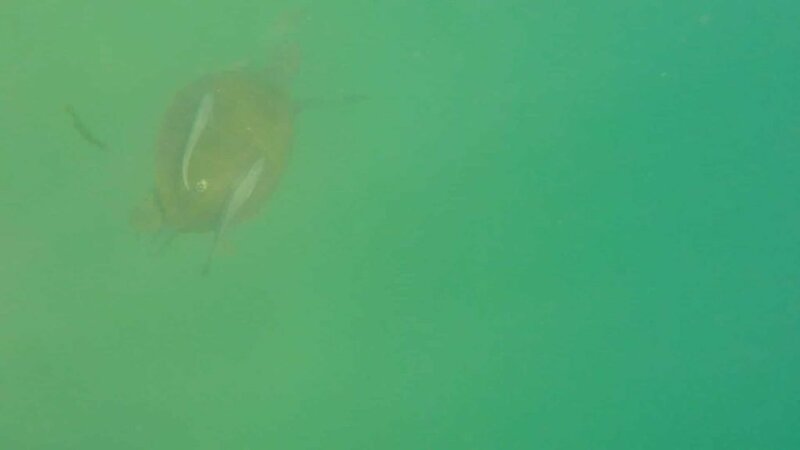 My GoPro was attached to my head and I fell overboard on the school of sharks while trying to film them. I turned my body and simply lost my balance on my board. I don’t remember ever jumping back on my board so quickly out of the water. 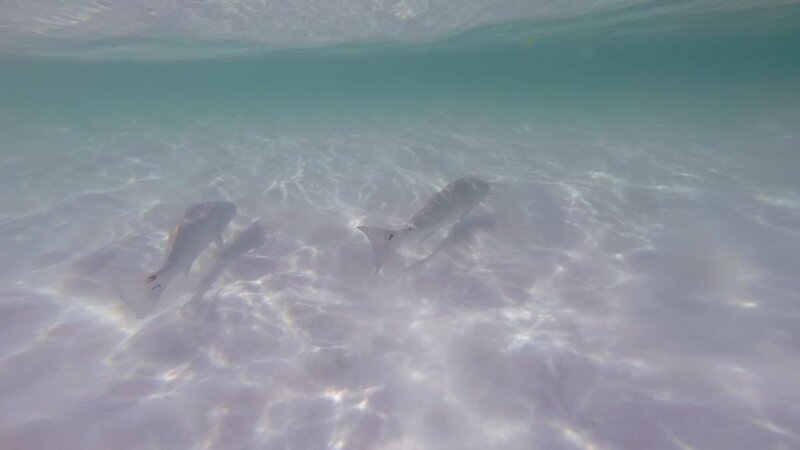 It’s difficult to see the sharks by the pictures below, but you can see their dark shadows. I think they were black tips, but not entirely sure. One of my favorite animals to encounter in the ocean are dolphins. They allow you to get fairly close to them and they are simply beautiful and they swim with such grace and ease. Shane and I encountered them early one morning and I had my GoPro mounted to the front of my board, which allowed me to get really good footage. We chased them around for about an hour – check out more footage by watching my video at the top of this page or by clicking here. 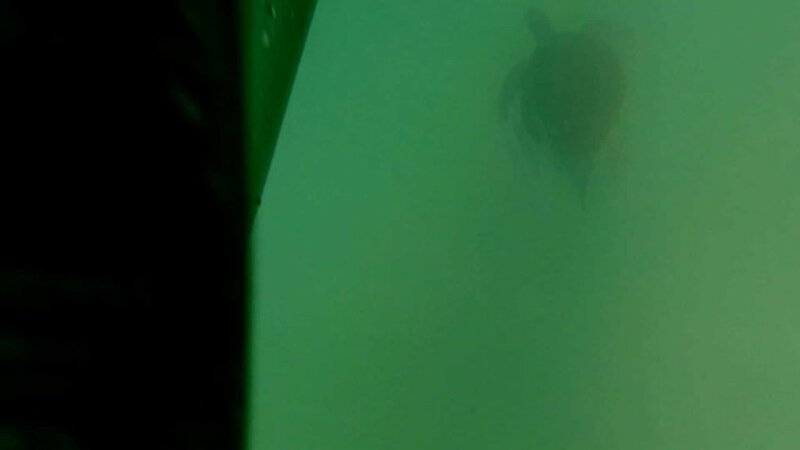 I have encountered a lot of sea turtles while paddle boarding in Destin Florida. They are more difficult to get close to than dolphins, but they are just as beautiful and graceful. 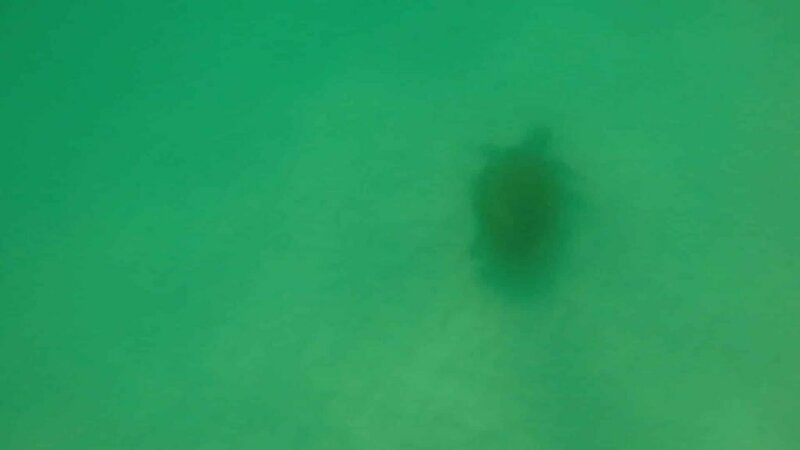 Sea Turtles are fast swimmers and they come to the surface often for air. 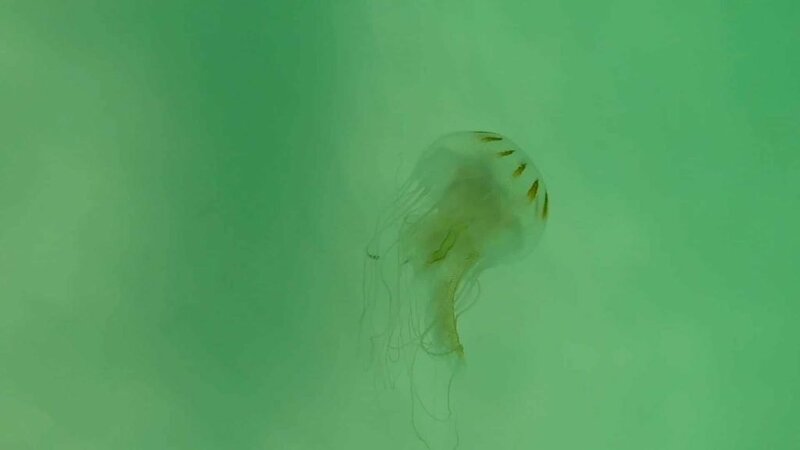 Ultimately, one of my least favorite animals to encounter in the ocean are jellyfish. 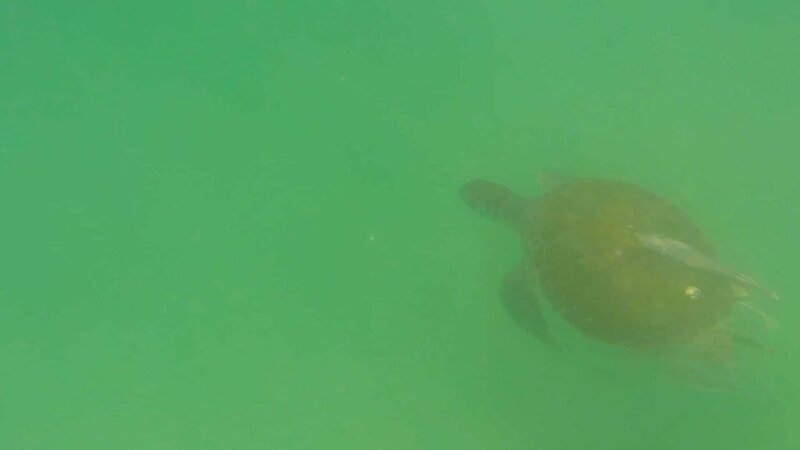 While they are magnificent creatures and vital to the ocean’s ecosystem, they certainly ruin perfect beach days. 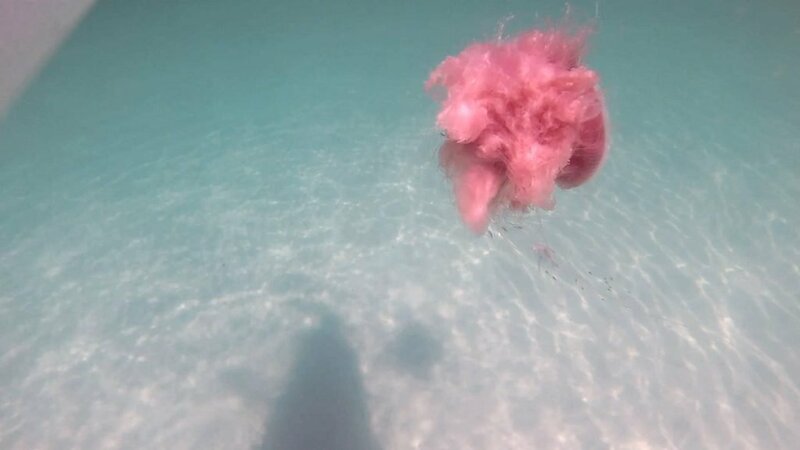 Jellyfish tend to invade beaches in Destin, Florida in July/August or when the water gets really warm. 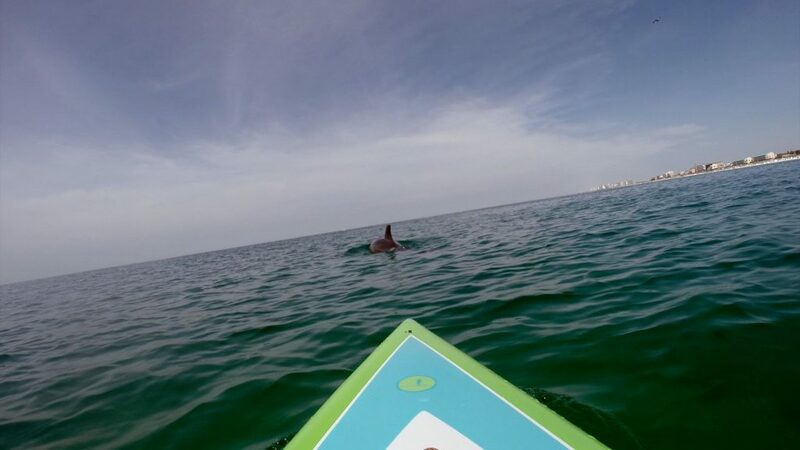 In addition, we encounter them often while paddle boarding in Destin Florida. 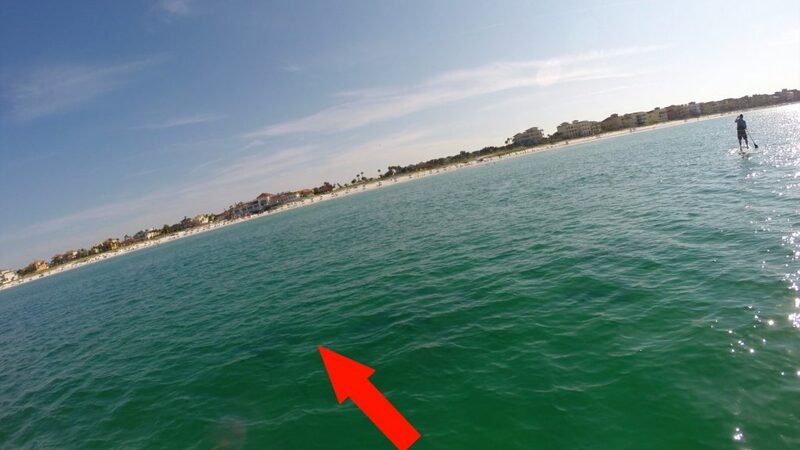 Obviously, there are plenty of fish to see while paddle boarding in Destin Florida. 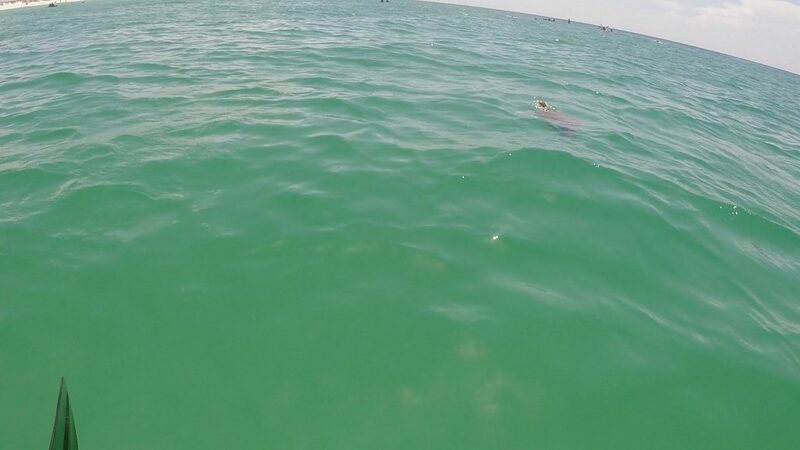 Often times, we see large redfish cruising the surf feeding on crabs and smaller fish. 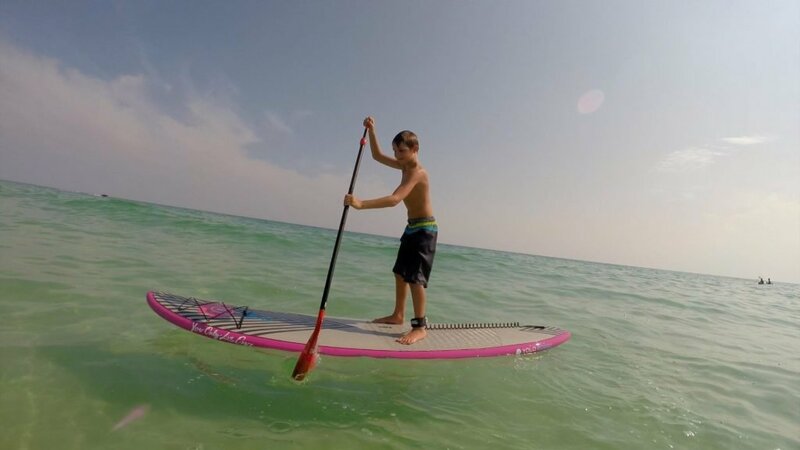 In conclusion, SUP is a great family activity that I encourage you to try. Furthermore, it is a great way to keep your body in shape, encounter wildlife, & create family memories that will last a lifetime. 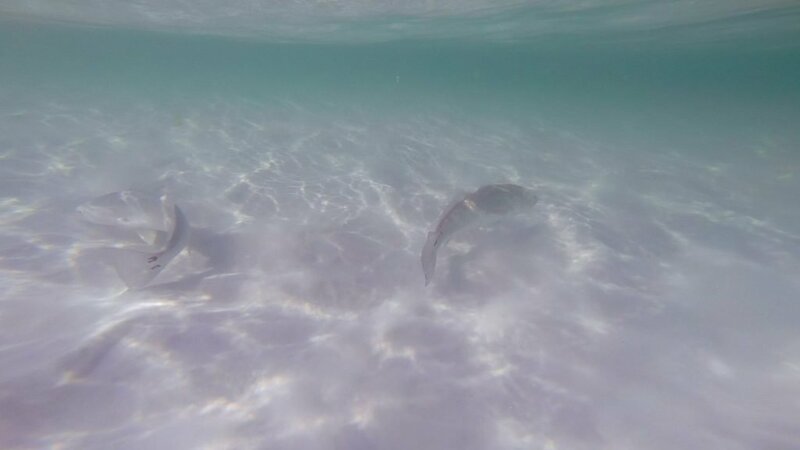 Additionally, be sure to checkout my post about how to find starfish and sand dollars here or check out our Disney Cruise Vacation here.